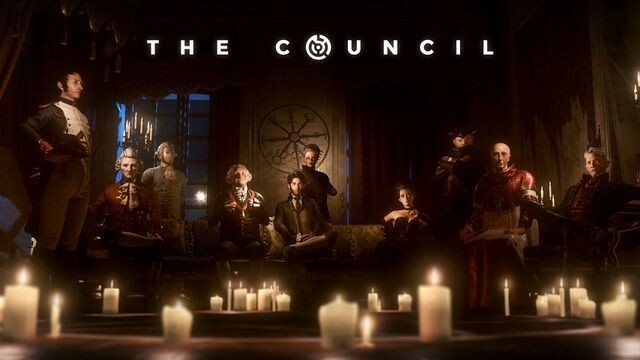 The Council, from French developer Big Bad Wolf Studio (making its debut effort), is an odd game to categorize. 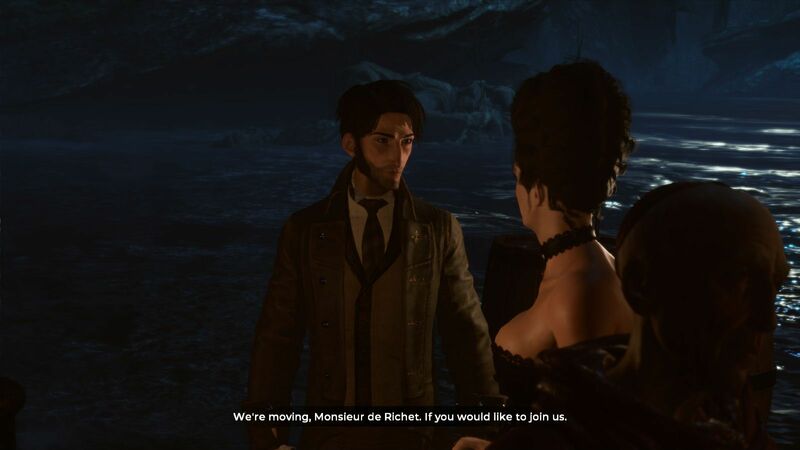 It sort of looks like an adventure, and it has some puzzles, but its focus is much more on conversations and research, and it also includes a variety of role-playing elements, like skills and experience points. Big Bad Wolf calls the game a “Narrative RPG,” and that seems accurate enough, if unusual. This review is for the game’s entire five episode season. 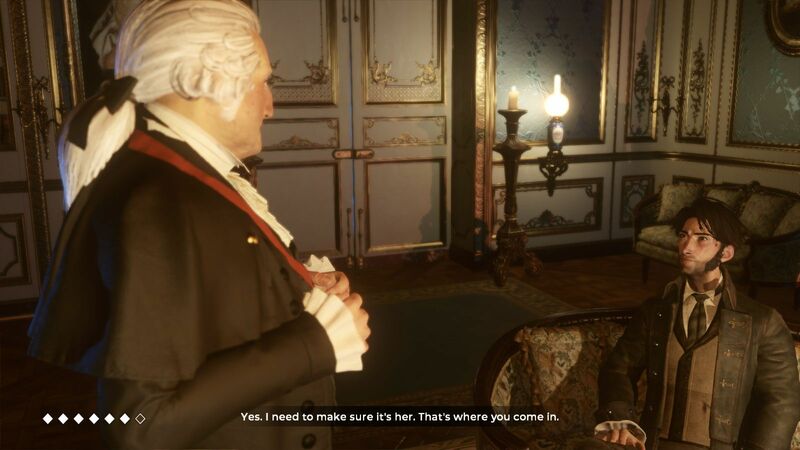 In The Council, you play young Louis de Richet. The year is 1793, and your mother, the leader of a secret organization called the Golden Order, has just gone missing on the secluded island home of Lord Mortimer. 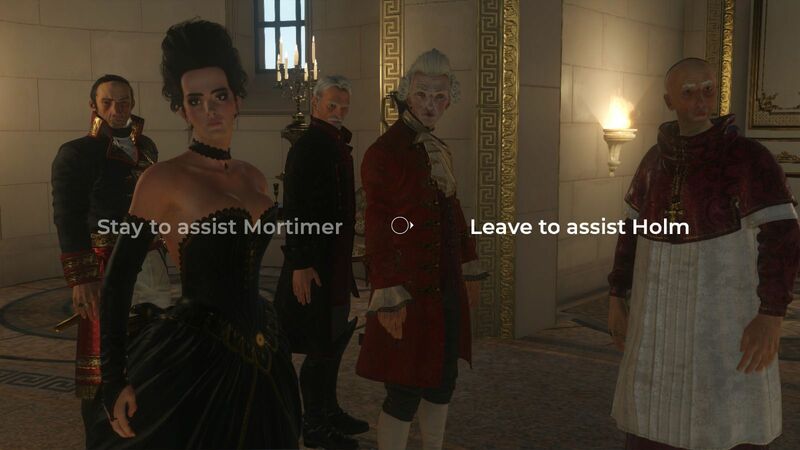 You’re invited to come over and help look for her, and when you arrive, you discover that Lord Mortimer’s estate is where important world decisions are made. 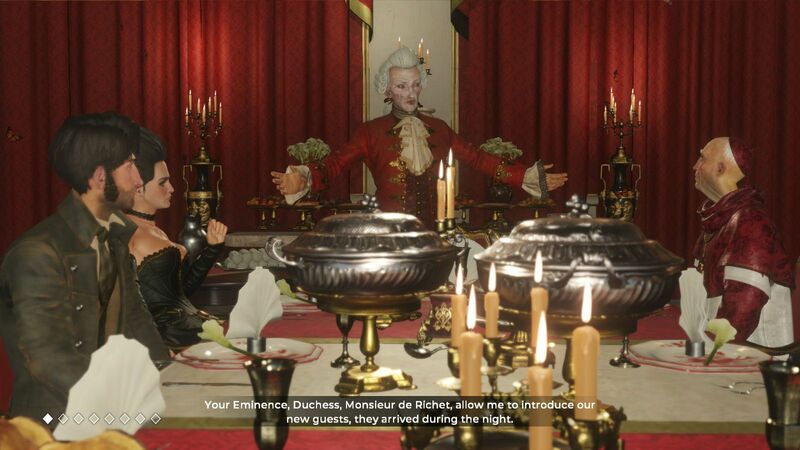 Soon enough, you’re talking to the likes of George Washington and Napoleon Bonaparte (plus a host of fictional dukes and duchesses), and you’re asked to take your mother’s place at the upcoming conference. So you have to mix political intrigue with your investigation, and it takes a while to learn who you can trust, what these strange conferences are all about, and what happened to your mother. 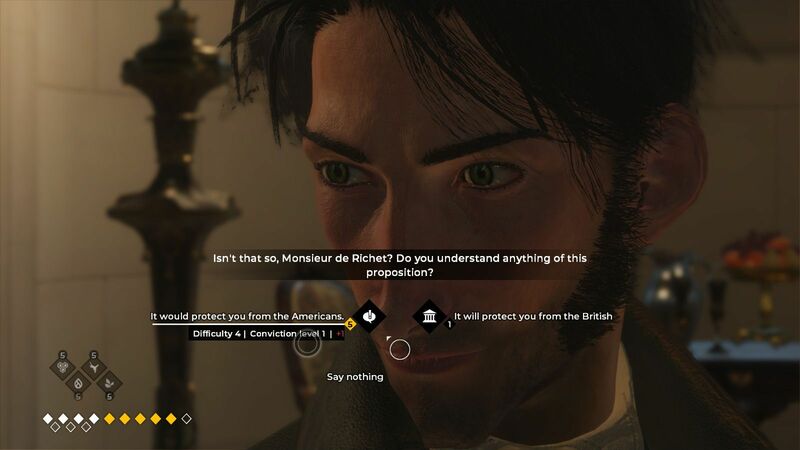 At the start of the game, you have to pick a class for your character: detective, diplomat, or occultist. This decision doesn’t really mean a whole lot. 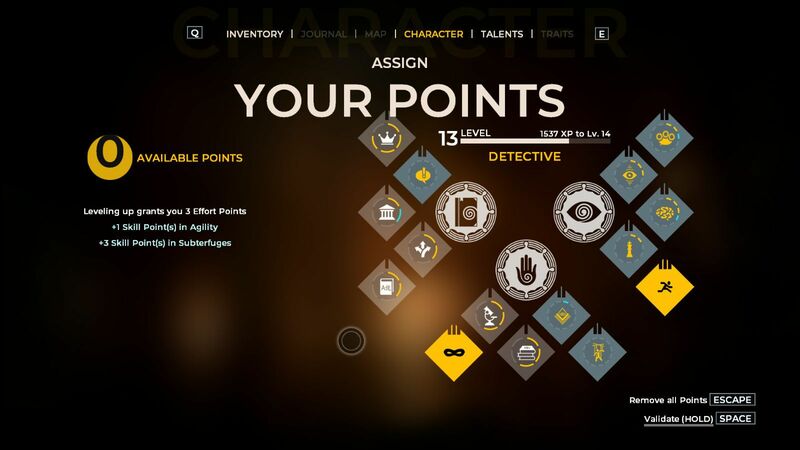 The game includes 15 skills, five for each class, and the skills associated with your class start out at level 1 (which means you can use them right away) while the other skills start out at level 0 (which means you can’t). But as you gain experience and levels, you also receive skill points, and you can spend these points on all of the skills. So you can still put points into the level 0 skills; they just require more points to level up. The skills include things like manipulation and diversion (good when talking to people), linguistics and erudition (good when examining things), and agility and subterfuge (good for physical activities). The emphasis of the game is on talking to people and examining things, which work about the same. In both cases, you walk around (using the WASD keys) and then you interact (using the left mouse button) with the person or object you’re interested in. This causes a list of questions or activities to spring up. When you’re talking to people, you might receive a general question to ask them, or you might get special manipulation or diversion options to trick them into giving something up. 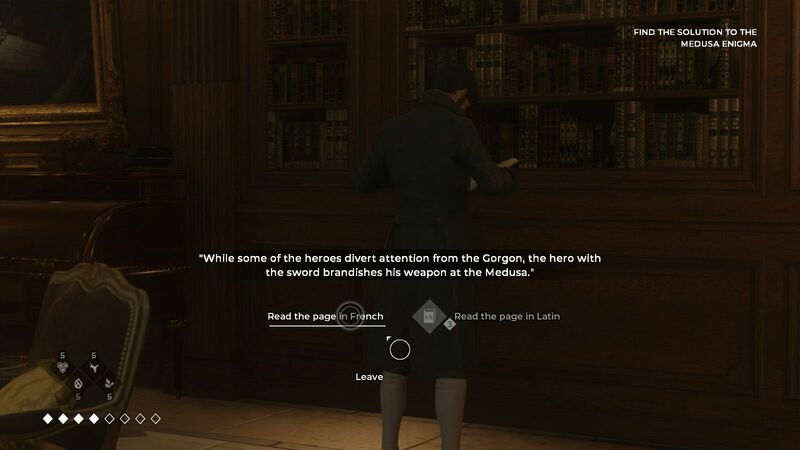 Similarly, when examining things, you might get some general options, such as just looking at the object, or you might get a linguistic option to read the object’s plaque or an erudition option to remember its history. All fifteen skills regularly come into play during the course of the game, so it’s a good idea to advance all of them to at least level 1. Sometimes when you use a skill, you have to expend “effort” to be successful. You get free effort points at the start of each “quest” (aka chapter) in the game. For extra effort points, you have to find potions around the manor. One potion gives you effort points. Another allows you to use a skill for free, thus saving effort points. There are also potions for removing “alterations” (such as being poisoned or intoxicated) and for displaying immunities and invulnerabilities when talking to people (so you know which dialogue options will work). Along with potions, there are also books (which add skill points), collector coins (which add experience), and amber fragments (which increase your maximum effort) scattered around the manor. 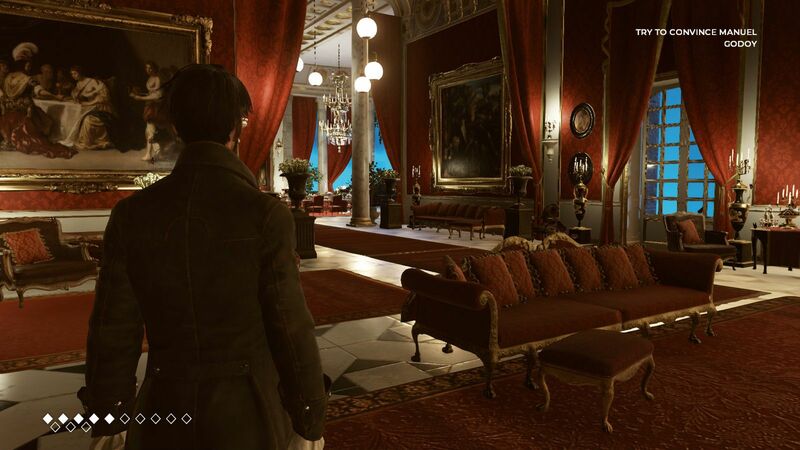 Unfortunately, all of the “pixel hunting” required to find everything is just plain tedious, especially since more items get added as you progress through the episodes, and so you have to search each of the manor’s rooms several times. I think the game would have been better off without most of the items. The potions make skill use too easy, and the other items barely do anything at all, and so taking them out would not only make your character choices more meaningful but also improve the game’s pacing. I spent 20 hours playing The Council, and I bet about half of that time went to hunting for stuff, which isn’t a good ratio. 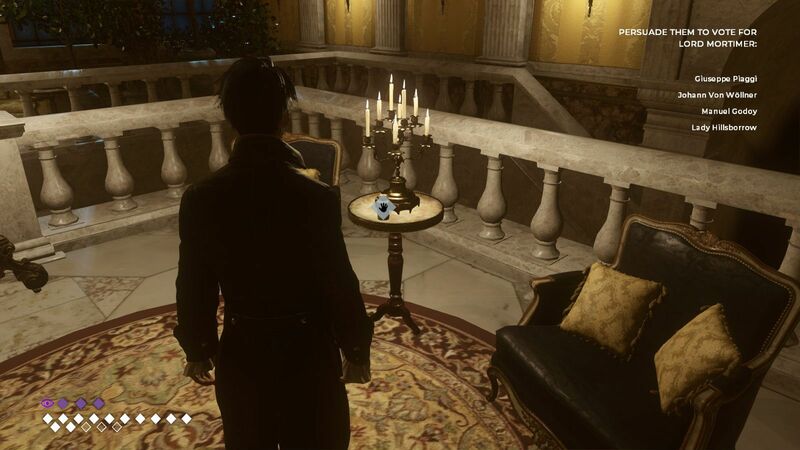 Along with the more investigative parts of the game, there are also a few puzzles. Most of the puzzles revolve around opening doors, such as figuring out the four-letter code for a chest (which becomes easy — spoiler alert — when you realize that the owner is a fan of a certain Greek god). The other puzzles usually involve researching for some goal, such as picking the “right” character from one of the Theseus myths. In general, I thought the door puzzles worked pretty well and the other puzzles didn’t. For example, the main clue for the Theseus puzzle states, “It’s up to the just to deliver judgment. 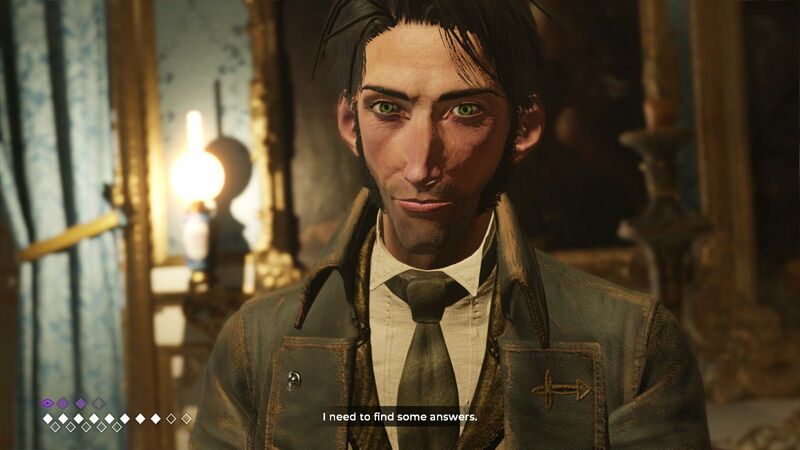 Truth unlocks all possibilities.” But that’s so vague it doesn’t help at all, and I ended up having to solve the puzzle through trial and error. Since The Council is a Narrative RPG, the most important part of the game is its story. Sadly, this didn’t really work for me, either. Everything starts out well, as you’re put into a strange environment with some mysteries to solve — and you get to talk to talk to George Washington, which is fun — but then about halfway through, the story takes a detour that sends it right off a cliff to crash and burn on the rocks below. Or maybe given the game’s locale, it jumps into the sea and drowns quickly. At the start of the game, I kept thinking, “This is interesting!” But by the end it was more like, “That was… strange.” And not in a good way. And so I didn’t enjoy The Council particularly much. It has some good stuff to it — the premise is great, and it’s fun sparring with (sometimes fictional) historical characters — but for me there were too many design issues, there was too much potion hunting, and the twist at the midway point just ruined everything. Luckily, The Council is priced pretty cheaply, and it’ll no doubt go on sale a lot, so if you’re intrigued by a game that I’d term an interesting mess, then it might be worthwhile to try out at some point. Plus, who knows, you might think the plot twist is great. This review is based on a digital copy of The Council for the PC provided by Focus Home Interactive.